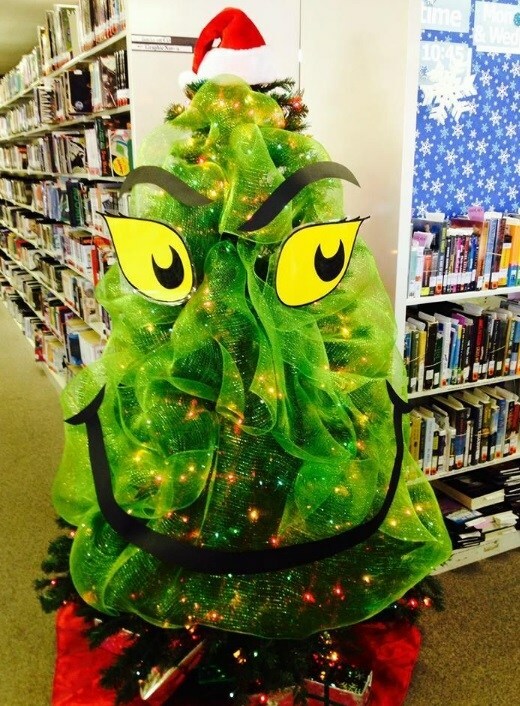 Christmas is one occasion when many amongst us love to showcase the creative side of our personalities. 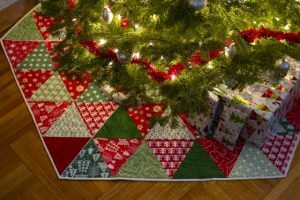 While you are eager to try your hands at a range of crafts this festive season, there is no denying the fact that quilting can give pure bliss due to the sheer coziness of the end product coupled with the plethora of inviting design options to choose from. A jelly roll makes this quilting project easy for you. The red ribbons add a pop of Christmas color to the otherwise rustic tree skirt. 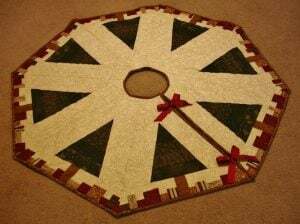 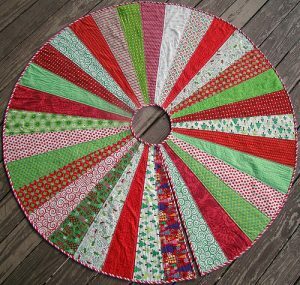 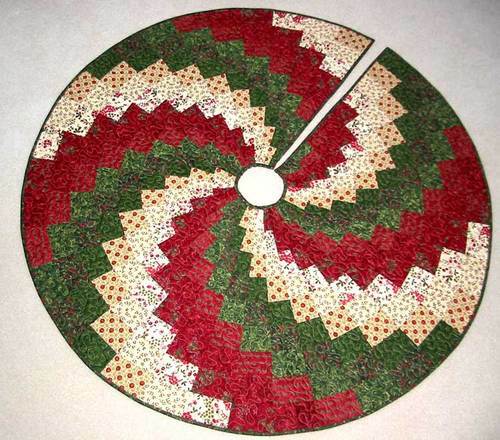 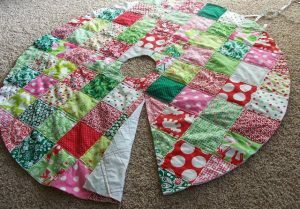 A wedge ruler and about 140 charm squares create this elaborate yet simple Christmas tree skirt. In this DIY, 88 6” squares of equal dimensions and colors are sewn together into 10 strips of varying sizes. The latter are again stitched together starting from the shortest. 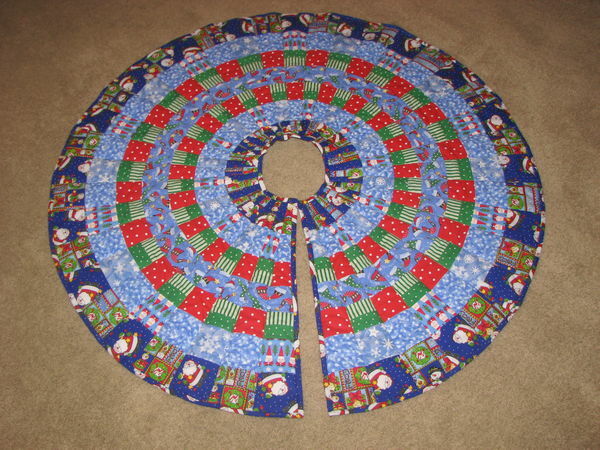 A spiral quilted Christmas tree skirt would require a little bit of your patience to be perfect. 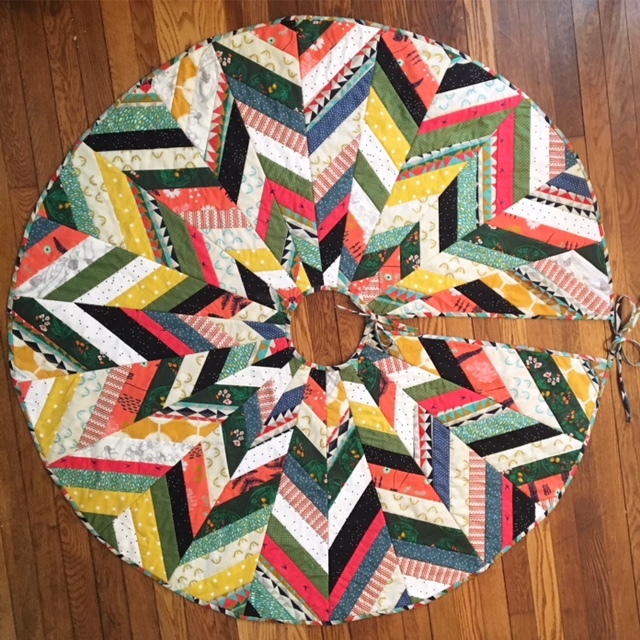 The binding might be tricky around the edges of the scrappy multi-colored fabric. Keep a 10-degree wedge ruler handy to help ease the efforts of making this bargello style Christmas tree skirt. 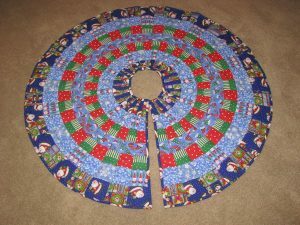 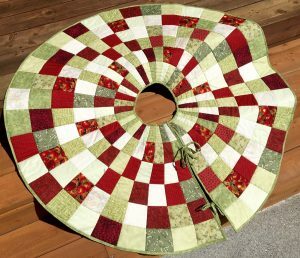 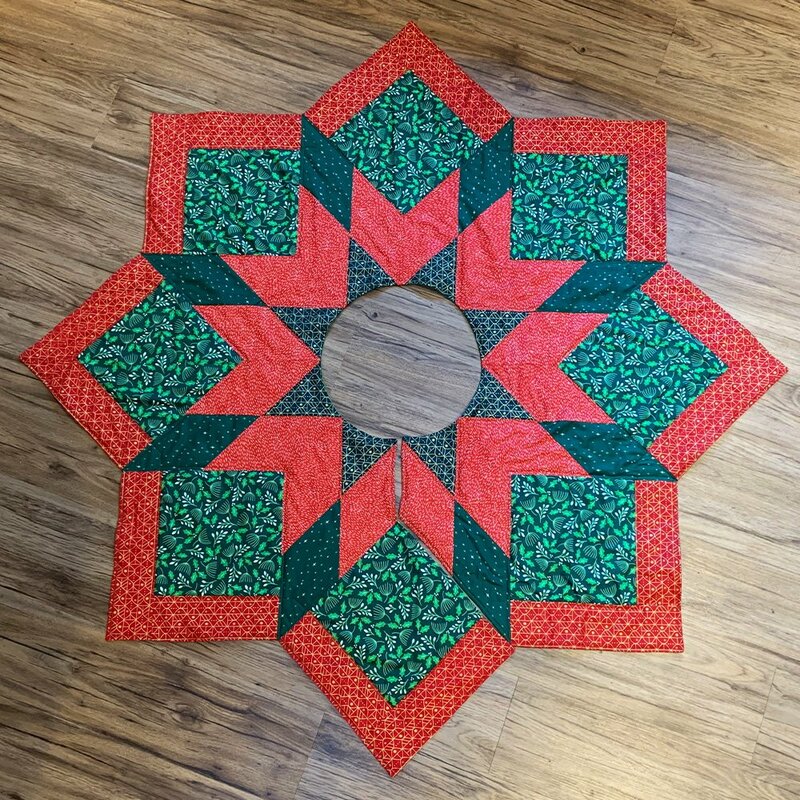 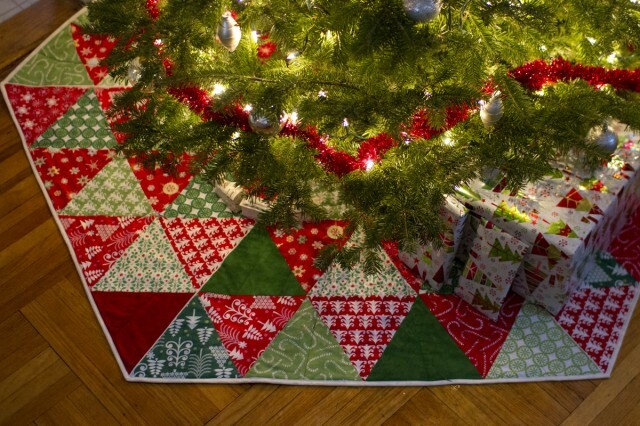 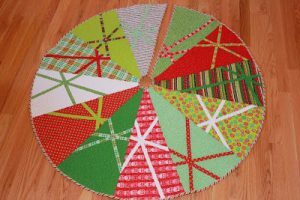 This large 60-inch tree skirt is easy to make in spite of the little geometry involved in creating the multi-colored panels. The 12 days of Christmas themed tree skirt boasts of cute bells, Santa and snowman appliqués machine embroidered all around the broad white border. 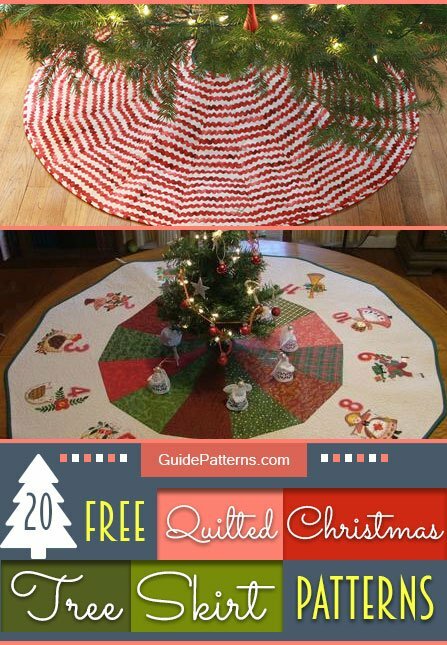 The front of this red-and-white tree skirt displays stars and mod tree blocks. 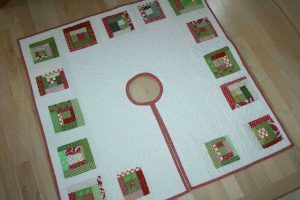 What you see here is the optional back side. 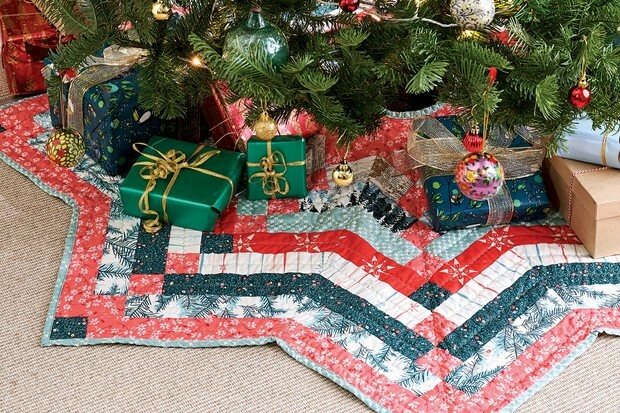 When correctly quilted and bound, it gives great texture when wrapped around the Christmas tree. 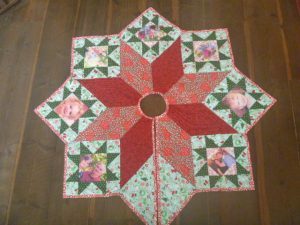 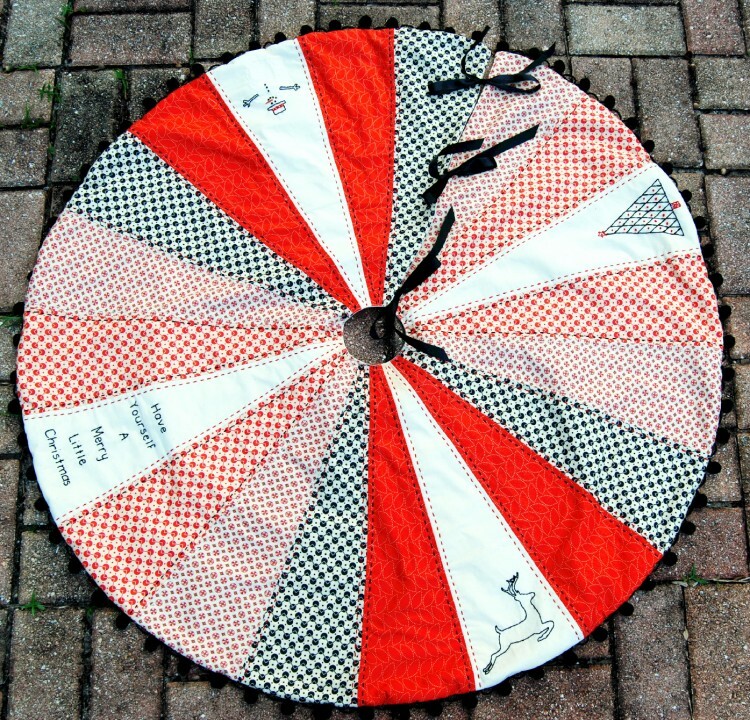 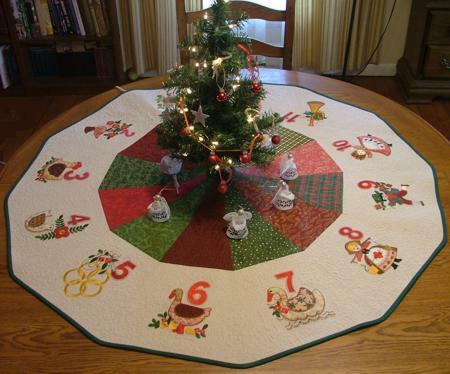 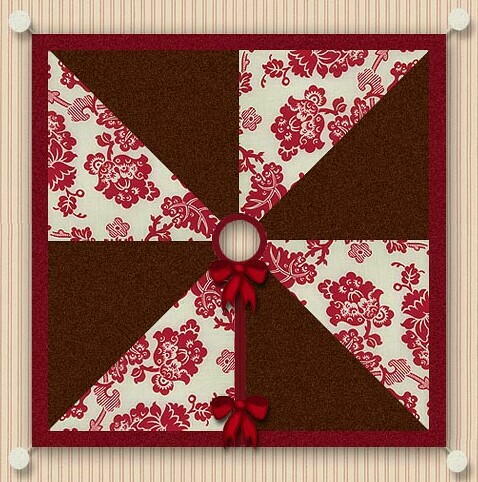 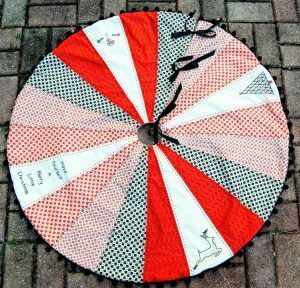 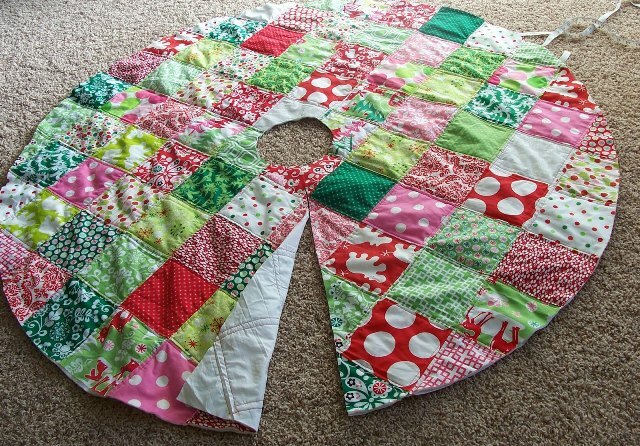 A merry go round quilted Christmas tree skirt is likely to become a hot favorite with kids. 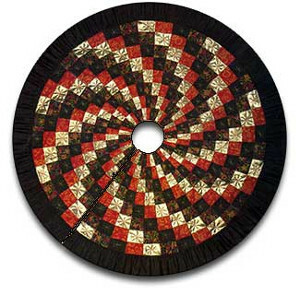 A technique of binding known as continuous bias lends a unique touch to this patchwork quilt. 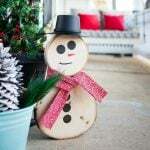 Click on the above link to get the details. 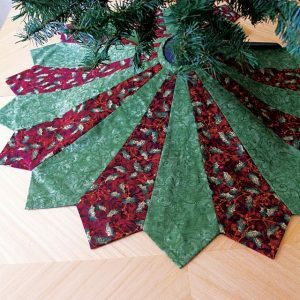 Holiday print fabric in the traditional Christmas colors with sleek crosses sewn near the wider end makes gorgeous Christmas tree decor. 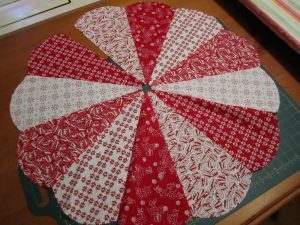 Apart from that, for the basic circular skirt with multiple sectors, you can use one of the above tutorials. 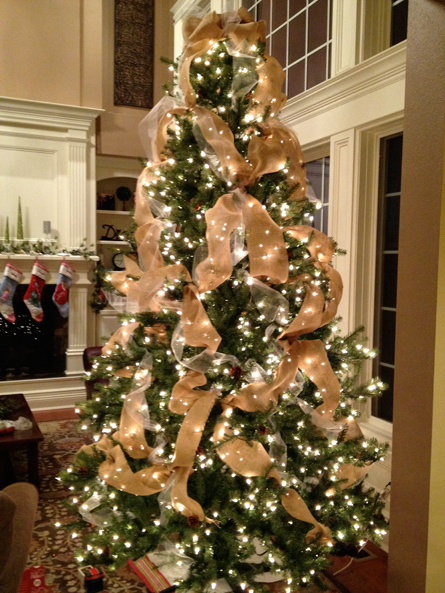 You can choose a gold colored velvet fabric to glam up the interiors of your home during a Christmas party. 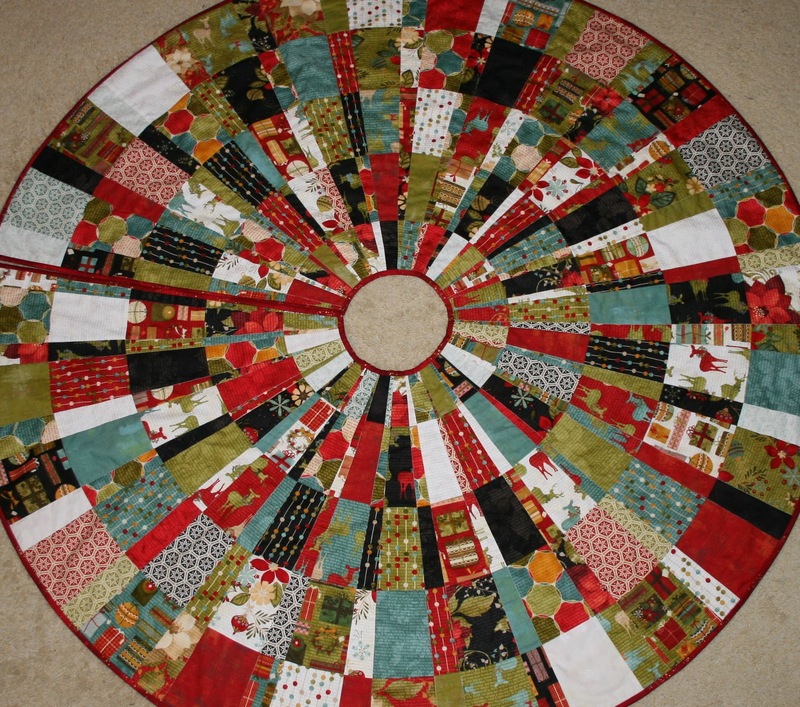 Don’t be surprised if your quilting endeavors become the talking point of the celebrations.